Solid preparation production line, which integrates the characteristics of domestic solid preparation production process, is a new kind of on-line operational process currently. Solid dosage production effectively combines wet granulation, dry granulation, fluidized drying, material handling and mixing. This line is composed of wet granulating machine, fluidized drying machine, dry granulator, mixer, vibrating plug and vacuum conveyor. 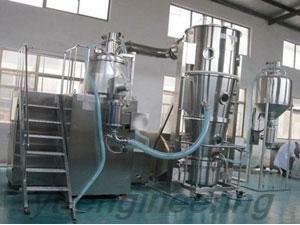 Drying machine is suitable for production of pills, capsules and granules. 1.Compared to traditional working process of granulating machine and drying machine, this new type of solid dosage production line adopts airtight transportation method, which ensures the granulating process and drying process complete in the same clean room. Therefore it has the advantage of eliminating the secondary pollution, making drying process more scientific and reasonable, reducing the footprint of equipment and promoting the production process to be further in line with GMP standard. 2.Solid preparation production line fully considers the matching degree between systems. Thus corresponding models of drying machine can be made according to users’ actual production capacity and formulation. 3.Solid dosage production line not only fully embodies the respective merits of wet granulator and boiling drying granulator, but also integrates wet granulator and dry granulator to ensure high granulation yield. 4.In this solid preparation production line, automatic and mechanized production line replaced the traditional manual operation, which reduces labor intensity and dust pollution. 5.In response to customer’s requirements, we can install automatic in place cleaning nozzle in granulating machine and drying machine to make a reliable guarantee for CIP.